10th Anniversary Edition with a new introduction! Now in hard cover! 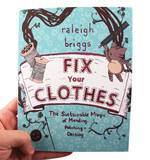 Raleigh Briggs teaches us how to craft a sustainable domestic life without relying on smelly, toxic, expensive consumer products. And it's not as hard as we may think! This hand written and drawn book of charming tutorials is both fun and accessible. It's full of simple skills that anyone can and should learn. From creating healthy tinctures and salves to concocting all-natural cleaners and body products to gardening basics, this book is great for anyone looking to live more simply, create a comfortable nest, and truly do it yourself. “Make Your Place: Affordable, Sustainable Nesting Skills” is a terrific guide for creating a healthier existence. Brigg’s personality shines in this publication and her authenticity is as unmistakable as her hand-printed text. "This hand written and drawn book of charming tutorials is both fun and accessible...Briggs teaches us how to craft a sustainable domestic life without relying on smelly, toxic, expensive consumer products." "I love this book ~ the pages are handwritten with illistrations ~ a tutorial to create your own salves, body care, first aid kits, health tips, cleaning tips and supplies ~ this is perfect! This book has 3 sections." this makes a great gift... that's how i got mine! "I recommend using Make Your Place: Affordable, Sustainable Nesting Skills by Raleigh Briggs as one of your go-to references. This hand-illustrated book offers simple, practical skills that anyone can learn and apply to everyday life ... One of the features I love most about this book is its conversational and witty tone. Briggs is never condescending and instead inspires the reader to better his or her life with his simple tutorials. Briggs also urges readers to be safe and offers helpful advice for every step of the way. Even though some of the recipes call for uncommon ingredients, I constantly refer to this book when I’m looking for natural and sustainable answers for my home." "From gardening to essential oils, Raleigh included it all! Not to mention the fact that the book is beautifully handwritten and illustrated. I often get my tips from the internet, but Raleigh’s book is wonderful to leave in the kitchen or bathroom as an instant recipe book and guide. A definite must-have starting guide for anyone interested in living a more sustainable lifestyle." "This primer on living cheaper and toxin free by Seattle DIY advocate Raleigh Briggs shows you how to cre ate natural cleansers, laundry soaps and body products, among other things, as well as how to plant a vegetable garden." "The book is written with charm and humor – I just love this book!" "I found this book for $7 the other day and have been reading it cover to cover at night, like it's a trashy beach novel. Raleigh Briggs packs this darling little tome with recipes that will clean your floors, clean your face, clean your dog. And that’s only three recipes out of dozens and dozens. I want to throw on a lab coat and pack all my old Mason jars with lotions and potions, oh my. Did I mention that it's all handwritten and illustrated? Most exciting for me is the section on tictures and salves. This is an area that is making my heart thump lately." "This book is written by a popular zinester out of Seattle by the name of Raleigh Briggs. This new book of almost 200 pages combines much of the work of her previous titles plus much more useful information for anyone who wants an all-natural home. Briggs illustrates the whole thing herself and it is just delightful. Beyond being incredibly useful, it is cute and funny as well. This little 4X5 book sits very nicely on the back of your toilet or just sitting about on the kitchen counter. When we purchased this book at Powell’s downtown, we just loved the look of it. It wasn’t until I got home and into the bath that I realized how incredible and amazing the content was. It’s one of those reads you just can’t put down until you’ve leafed through the whole thing! This woman has a handle on how to live in our world while being sustainable and organic. Kuddos to Briggs!" 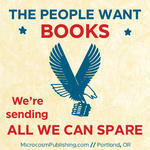 "I bought myself this lovely book last time I was at Powells. 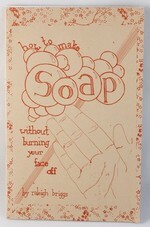 I've always been intrigued with the idea of making my own soaps, cleaners, etc. but I feel like I need someone to hold my hand during the process. Raleigh Briggs totally does that. The zine is written in a very casual voice, like I was having a conversation with Raleigh Briggs over a cup of tea. It's packed full of custom illustrations/diagrams and hand drawn typeography which makes me happy! Some of my favorite articles were on Pest Control, Cleaning Drains, and PMS." "Raleigh Briggs has created one of the most appealing DIY titles I’ve had the pleasure of carrying in my bag for two months straight and reading snatches of on the subway. Make Your Place is a pocket-sized guide to all-natural medicine, house cleaning, and gardening skills, hand-written and illustrated in the loveliest old-fashioned pen sketches of flowers and herbal concoctions. There are charts for herbs to soothe your cold’s symptoms, make your hair its shiniest, and plant with your vegetables for maximum symbiotic growing awesomeness. There are recipes for Sink Volcano Sink Cleaners, Allover Health Tonics, and Rose & Honey Face Wash. Briggs has a welcoming, friendly style that makes you want to wildcraft alongside her, and she is always careful to note health and safety issues ..."
"Make Your Place is a 128 page tutorial of sustainable domestic tools aimed to defy consumer consciousness. From creating tinctures and salves, to concocting all-natural cleaners, to gardening basics, this book is great for anyone looking to live more simply and truly do it themselves. Its zine style makes it feel like it’s written just for you by an informed, helpful friend…"
"This little book packs a lot of info on health/first aid, housecleaning, and gardening, focusing on how to use herbs and other natural ingredients in place of your everyday toxic chemicals. Some of the tips are super easy – simple recipes for natural bleach and other cleaning materials should be considered by all, as is using dried herbs to repel bugs and pests. (Aside: bay leaves work great against pantry moths!) Other stuff I don’t quite see myself doing, like making my own toothpaste and shampoo. But there’s useful information here for any DIY’er, including lazybones like me. Make Your Place is done zine-style, so expect lots of neat handwriting with flourishes and illustrations by the author. The writing style, like the illustrations, is cute rather than cutesy, mixing fun with facts without seeming hippy-dippy. I also have to commend the author for ensuring readers’ safety with warnings on allergies and side effects. 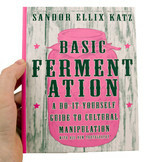 Bottom Line: Great fun-to-read resource on keeping a toxin-free home." "Thumbing through my copy of Raleigh Briggs’s Make Your Place: Affordable, Sustainable Nesting Skills looking for an anti-bacterial bleach-like cleaner, I came across her recipe for baking soda “shampoo”. ... Raleigh suggests using a few teaspoons of baking soda – made into a paste with a little bit of water – and massaging it into your wet hair in the shower. So being very curious, I tried it and holy moley – it works!" This cute, cute handwritten and illustrated book is awesome--it teaches you ways to clean with basic, less toxic products, how to make compost, some natural first aid stuff, etc. Hence the purchase of borax, baking soda, and spray bottles. Though I'll have to wait to try some off the stuff since my enormous jug of white vinegar only had a splash left, I already had a stinky, back-washy reason to try her "DIY Drain Opener." Eww. Thankfully, her recipe worked like a charm! Yay Ms. Briggs for a great book! I really liked her non-militant tone throughout--I never felt like she would look down on me for not using homemade toothpaste. She's got this "hey, did you know you could make this yourself?" attitude that really appeals to someone like me, who's not into the DIY movement for its modern, ecologically-correct facets, but for its links to tradition. " "Raleigh Briggs offers easy to use instructions for things like household cleaners, herbal salves and tinctures, how to compost and what to plant in your garden. The book is divided into three sections: Health and First Aid, Nontoxic Cleaning and Body Care and Gardening. Each recipe is detailed by adorable drawings and is accessible to even someone as spazzy as myself." "Raleigh Briggs is not interested in the trendy side of conscious living. For Briggs, "DIY is not a show of prowess, or even a hobby; rather, it is a necessary step towards living our lives on our own terms." Her three-part zine, Make Your Place: Affordable, Sustainable Nesting Skills, is a beautifully handwritten and illustrated little info-packed guide to commandeering the "tiny, artless actions" of healing, cleaning, and gardening that most people are content to leave in the hands of the Target Corporation and Johnson + Johnson. Make Your Place is not written for the melt-n-pour soapmaking set; this is Mother Earth News for apartment dwellers, squatters, and landowners alike. But don't let the back-to-the-land vibe leave you feeling excluded -- Briggs's recipes and knowledge are absolutely accessible and regular person-friendly. If you're ailing and not itching for a co-pay and carbon-copy treatment from your local MD, hie thee to the "Health & First-Aid" chapter, where you'll find basic methods and simple recipes for tinctures, infusions, decoctions, and salves as well as a pretty comprehensive list of antibacterial, antimicrobial, and antiviral herbs and their myriad applications. Some recipes may seem out of reach for people whose arid lawns don't grow common, useful weeds like plantain and marshmallow -- buying these ingredients from mom and pop health food stores (when you can find them) or one of the many indie herbal suppliers available online still seems to make more sense from the perspective of conscious caretaking than downing another round of amoxicillin. Cleaning your home, clothes, and self becomes healthy and cheap with the neurotoxin-free concoctions Briggs includes in the "Nontoxic Cleaning & Body Care" chapter. Make some pretty soul-pampering cleansers with things from around the house, like baking soda, lemon juice, salt, and cornstarch, and a few other items like borax and washing soda that you can get from the grocery store for a few dollars. You won't find a soap recipe -- check out Soap: Making It, Enjoying It by Ann Bramson (Workman Publishing Company, 1975) to add that skill to your set -- but you will find lots of sweet-smelling furniture and appliance cleansers, a rose and honey face wash, and a super precious face oil for dry to oily complexions that is poised to give Lancôme a run for its (and your) money. "Gardening" gives you a brief rundown of plant anatomy and garden design, as well as instructions for companion planting, composting, and improving soil. If the concepts of raised and sunken beds, seed starting, heirlooms, and hardening off (not what you might think) baffle you, Briggs will set you straight -- in under 50 pages. Some of these ideas you've seen before, others, like the homemade fly-strips on page 61, may be fresh and new. Make Your Place is not groundbreaking news, but rather an outstanding collection of Earth and body friendly instructions for living a life based on the perhaps forgotten skills we should all have to do it ourselves." 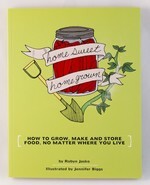 "It is a gem, all hand lettered and illustrated in a style similar to Mollie Katzen's original Moosewood Cookbook and it is filled with recipes and concoctions for everything from salves and ointments to face oil and deodorants to everything there is to know about getting a garden started. I love this book!" "a completely wonderful and delightful little book with A LOT of good info on health & first aid, non-toxic cleaning, body care and gardening." "This little book has all the intimacy and charm of a hand-written letter. Born out of a series of workshops in Seattle, Washington and previous zines on the subject, it contains all sorts of interesting information on the use of non-toxic materials for First Aid, cleaning, body care, gardening and composting. Many recipes for products are given; the author believing that making these is a spiritual and life-enhancing act, as well as the most basic step we can take to save our planet. The style is very vernacular, the author addressing the reader as a friend and fellow traveller. The many pen and ink drawings are simple but nicely executed. This is a pleasant and worthwhile publication and one which serves a very useful purpose." "This book was (and still is!) extremely helpful in helping me create my own potted garden on my porch, among other things." "Some skills are just good to have. "Make Your Place: Affordable, Sustainable, Nesting Skills" is a collection of simple and effective skills to improve one's life around the house. The skills range from dealing with the simple messes, to the injuries one faces in life, to dealing with menstrual-cycle induced bad moods. "Make Your Place" is a fine and recommended read for anyone who wants to make their life a little smoother and more enjoyable." "As a sort of antidote to the cheapening of thrift culture, I’d enthusiastically suggest picking up a copy of Make Your Place: Affordable, Sustainable Nesting Skills by Raleigh Briggs. Recently published by Microcosm, it’s an adorable, addictive, pint-sized compendium of DIY advice, ranging from house-cleaning solutions and garden-tending skills to nontoxic bodycare products and natural remedies. There is an extra spoonful magic in Briggs’ pages, though. Make Your Place is neatly hand-lettered and illustrated throughout; the first two chapters began life as zines. When looking to disrupt the low-wage, productivity-maximizing philosophy of cheap, picking up a book that’s been crafted with such care, it seems to me, is quite an appropriate rebuttal." "i got my new favorite book in the mail the other day. it’s called Make Your Place: Affordable, Sustainable Nesting Skills by Raleigh Briggs. i brought my little book with me on my trip to seattle and have been reading it every chance i get! i haven’t gotten through the whole book yet. but so far, i’ve learned how to make homemade tinctures, shampoo, salves, aloe gel (super stoked on this one! ), face soap, body scrubs all the while learning which essential oil to use when. mind blowing! my whole world is turned upside down! or should i say rightside up? i can’t wait to get home and make my own tinctures and toilet bowl cleanser and face soap and shampoo and… and… AND!!! sorry. breathe… i’m just super duper excited. the book is chalk full of natural remedies and recipes for everything you need around the house. i love how the book is designed. everything is hand written and hand drawn. the header for each section is a tiny master piece in itself. raleigh draws pictures of the various herbs and roots. it makes it fun and educational to read." "This is a great little book with a little price that provides much-needed help for beginning herbalists, DIYers and homesteaders. I highly recommend it to anyone just starting out (like me!)" "We just received Make Your Place, an adorable book that will teach you the skills for a naturally clean and happy home and an abundant garden. Raleigh Briggs shares her knowledge of traditional and sustainable domestic skills in this endearing handwritten book. This handbook is great to have around--you can learn everything from making your own natural skin care products to composting to making your own herbal first aid kit. Also, Raleigh is a hilarious writer and makes us laugh." I have pursued every element in this book separately, and at many times wished there was a short, sweet home manual that served as a quick and easy reference guide to taking care of bumps, bruises, laundry, physical well-being, and pesticide-free gardening. Here it is! Briggs’s book urges people to listen to their bodies and learn to heal themselves and prevent illness naturally, in a cost-effective, holistic manner, while also respecting the wisdom of health care professionals and the choice to use conventional medicine. But it’s her pragmatic approach to taking back your home that is what makes this book so appealing. While the herbalist-inclined and well-seasoned “do-it-yourselfers” and recyclers may find this to be a collection of old news, I found it to be a simplified and comprehensive manual on many levels, and even a Gideon bible-like manual that should be heavily circulated to people who are just scraping by in life, in need of some inexpensive inspiration, as well as a price cut in their trash removal. Briggs very clearly writes and illustrates how to break away from buying prepackaged mainstream medicines, pesticides, and cleaning products and go almost entirely green at home. Were someone to pop out of bed one morning and decide they were fed up with Clorox Bleach, Theraflu, professional landscapers, and Tylenol, it would be quite a task for them to pore over stacks of books trying to reinvent their life skills, yet this wealth of knowledge is contained herein–Briggs understands one of the basic needs of nesting is being efficient, and that appears to be one the inspirations that birthed this book. Her writing style is very casual, easily approached, and, at times, absolutely hilarious. Briggs seems to know what an undertaking it is to overhaul one’s nest and lifestyle from “chemical” to “green,” and this awareness shows in her writing and illustrations. She demystifies the green way to live without spending an insane amount of money on “green products,” which are often very pricey. The cost of the materials needed for the DIY recipes are even cheaper than most generic cleaning products. I came away from reading this book feeling that it was not such a daunting task to change my lifestyle from the everyday path to a road less traveled, and it will make a big difference with my home, children, and budget, as well as reduce my ecological footprint on this earth." "Saving a buck has become de rigueur. The only trouble is that cheap has supplanted thrift as stores proffer “affordable” products courtesy of low-wage labor and disposable design. Where’s the revolution!? Make Your Place is a forceful antidote to the cheapening of thrift culture: a meticulously hand-lettered, pint-size volume of natural first aid, nontoxic cleaning and body care, and gardening know-how. When you raise your fist against the values that derailed our economy, lift this book in it." 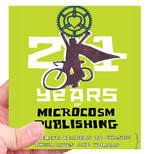 "Another in the assortment of Do It Yourself books from the folks at Microcosm. I should totally feel like they are getting redundant with lots of books that essentially cover the same stuff in a slightly different way each time, yet each one seems to have it’s own personality and gives me something new to be interested in. And the fact that I just flew through this book with such interest leads me to think a couple things- I’m getting old and really domestic, and that my mother would probably love this book. So what does that say about me? 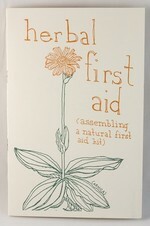 Essentially, this is a book that (all handwritten and illustrated) goes through ways to make your own first aid materials/ medicines/ ointments, cleaning products, and gardening skills. There are numerous recipes for making everything from toothpaste to laundry detergent, all without the use of nasty chemicals and so on, so forth. I personally feel that’s a great idea and as someone who is a level 5 vegan I tend to think that I neglect these things more often than I ought to. So having a guide on how to make some of this stuff yourself naturally is a great resource. Plus, I’m an avid gardener, so having some additional info on that is cool as well. The medicinal info sounds like the sort of mumbo-jumbo Grandpa Simpson would spout off, expect that these really are old timey-type cures for things like headaches, fevers, burns, and other minor ailments involving herbs, tinctures, and ointments. Neat stuff from a corner of the all-natural side of things often overlooked." I have been devouring this book, Make Your Place— Affordable, Sustainable Nesting Skills, by Raleigh Briggs for the last week or so. It's so flipping good. It's got recipes for all kinds of homemade goodness; cleaning products, bath and personal care items, general gardening info—just a ton of great stuff. She also includes bits about working with herbs and has another zine that's about assembling a herbal first aid kit, which I also love. I know I saw this book on a blog somewhere, but I don't remember where right now. It was a few months ago and only just recently remembered it. The whole book is hand lettered and hand drawn. I there is about 100 levels of cool here. As someone who makes her own deodorant and underwear, I feel a urge to stalk this woman. I got my copy, along with some other rad zines, over at Microcosm Publishing here in town. But in a fit of extreme lameness, I actually ordered it online rather than going to the shop, because dang with the 3 kids and nap times and all that, it just wasn't happening. You know how it goes. I actually was able to browse more and take my time online than I would have with the 3 lovelies in tow. So, I still need to actually go there, but the mail service was mighty fast anyway. You can also get a copy at buy olympia. 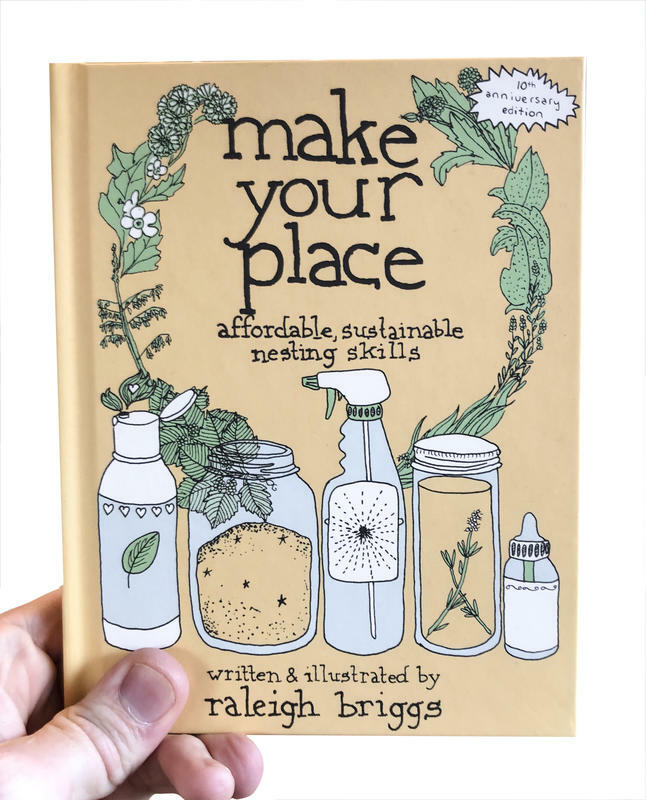 Raleigh Briggs’ Make Your Place: Affordable, Sustainable Nesting Skills is a fully hand-drawn book from Microcosm Publishing that’s packed with projects for making all sorts of supplies for the home. The 128-page book is a total steal at just $5! If you’re feeling splurgy, you can pick up Briggs’ other DIY zines, also from Microcosm: Nontoxic House Cleaners and Herbal First Aid for another dollar apiece! "Brought up on Helpful Hints from Heloise, we didn't know a home "how to" book could be so...cool. Hand written and illustrated by Raleigh Briggs, Make Your Place is a gem of a book full of information and DIY ideas for non-toxic clean cleaning, natural body care and gardening. Its zine style makes it feel like it's written just for you by an informed, helpful friend. Make Your Place is perfect for families looking to live more simply and naturally. It's filled with things we used to know and forgot as well as ideas and tutorials that are easy, inexpensive and good for your home and the earth." I bought this for my mom for Christmas, but after looking through it and not being able to put it down, I think I need to buy one for myself, too. I found this book for $7 the other day and have been reading it cover to cover at night, like it's a trashy beach novel. 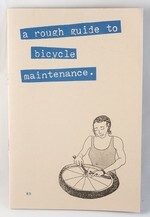 Raleigh Briggs packs this darling little tome with recipes that will clean your floors, clean your face, clean your dog. And that’s only three recipes out of dozens and dozens. I want to throw on a lab coat and pack all my old Mason jars with lotions and potions, oh my. Most exciting for me is the section on tictures and salves. This is an area that is making my heart thump lately. I will report back after the experiments are in full swing. 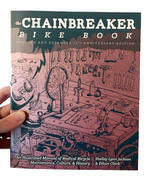 In the meantime, check out the company's great catalog of other books and zines. I just bought the best book in the world and I think many of you who are interested in this thread will like it too. It is called Make Your Place: Affordable, Sustainable Nesting Skills by Raleigh Briggs. It's not easy being green - especially as ready-made corporate pseudo-solutions to everday needs are pushed down our throats by the new "green" capitalism, making sustainability (or rather a vague feeling of absolution from guilt over habits of overconsumption) a privilege for those who can afford it. So naturally we were exceptionally pleased to see the latest from our friends at Microcosm Publishing, Make Your Place: Affordable, Sustainable Nesting Skills - a compilation of simple, really sustainable solutions to basic problems - with sections on organic gardening, industrial chemical-free house-cleaning, and natural health remedies. And all in pocket-size, hand-lettered $7 book. I just got in the mail today Make your Place, which is a charming and super helpful book by Raleigh Briggs. All handwritten and illustrated ways to make your own natural and herbal first aid kits, cleansers, body products and also gardening tips. she puts these things into a whole new perspective on how to live a better, healthier sustainable domestic life.